Pointing out that the recent escalation of violence is due to military aggression and sabotage activities of Sri Lanka Army (SLA) supported paramilitaries, LTTE's Political Head Mr. S.P.Thamilchelvan stressed the urgent need for effective implementation of the Cease Fire Agreement (CFA) and the critical need to maintain Muslim, Tamil amity to maintain peace, when he addressed the media following a meeting with the Norwegian Ambassador Hans Brattskar Friday morning. The meeting that began at 9:30 a.m. lasted for one and a half hours at the LTTE's Peace Secretariat in Kilinochchi. Mr. P. Nadesan, Head of Tamileelam Police and the Head of LTTE's Peace Secretariat Mr. Pulithevan also participated in the meeting with Norwegian Ambassador Mr. Hans Brattskar. Second secretary of the Norwegian embassy, Tom knappskog accompanied Mr Brattskar to the meeting. Referring to Sri Lankan President Mahinda Rajapakse's invitation to Norway to continue with its facilitatory role to the peace process in Sri Lanka, Thamilchelvan told reporters that the change of Government in Colombo is a southern affair, and that the Norwegian facilitation and the monitoring are continuing uninterrupted in LTTE controlled areas. "Our leadership has always been positive to and supportive of the Norwegian facilitatition," LTTE's political head told the reporters. Norwegian Ambasador Mr. Hans Brattskar [right] with Tom Knappskog, second secretary of the Norwegian Embassy. Referring to the situation in the East, LTTE's political head said LTTE was fully aware of the forces attempting to cause dissension between the Muslims and Tamils in the east. LTTE leader Mr. V. Pirapaharan has issued clear directives to district level political and military wings of the LTTE to be vigilant and to take all efforts to strengthen relationship between the two communities, Thamilchelvan told the reporters. Thamilchelvan said the LTTE was aware of the anonymous handbills issued by nefarious forces to threaten and create fear among resettled Muslims in Jaffna. Thamilchelvan stressing the critical importance of Muslim Tamil relationship appealed to the Muslims to ignore the anonymous threats and said Tamils and Muslims should act with restraint and not fall prey to the forces attempting to create disharmony. The Norwegian Ambassador briefed LTTE's Politicall Head on his meetings with SL President Mahinda Rajapaksa, his visit to New Delhi with former peace envoy and Norway's Minister for Development, Mr. Erik Solheim, the concerns related to the tense situation prevailing in the Jaffna peninsula and the urgent necessity for the parties to meet and find ways of effectively implementing the Cease Fire Agreement, LTTE's Peace Secretariat said. For a question on the LTTE's stand to Mahinda Rajapakses framework of Unitary state, Thamilchelvan replied that a clear answer was provided in LTTE leader's Heroes day speech. The movement is prepared wait some time to see Mr Rajapalse'sa appraoch to peace to ascertain if the stand was a pre-election necessity, and if the new President has grasped the fundamentals of the struggle, Thamilchelvan said. 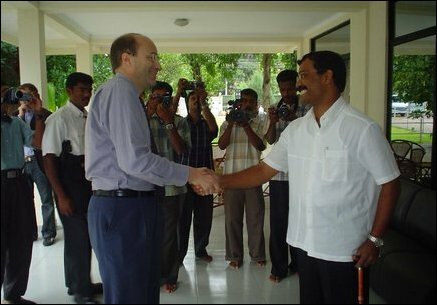 A High level delegation of the Norwegian Government would meet LTTE leadership to discuss the process forward, Mr. Thamilchelvan added and said the meeting did not focus on the process forward. It was a meeting where the official stand of the new Sri Lankan Government with regards to Norwegian facilitation was expressed, he added.